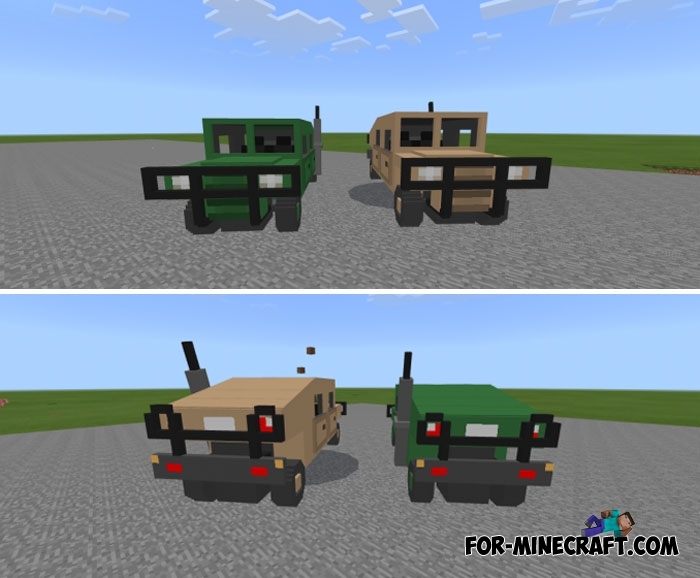 Right now you can become a real soldier in Minecraft Bedrock by installing this and a couple more addons. The Patriot is a military truck intended for transporting soldiers and military equipment, it is used in GTA and is a fairly large and durable car. There are two versions: for the forest and desert terrain, you can drive both since the addon replaces spiders. Take the key (traditionally it's a carrot on a stick) and sit on the driver's seat. The patriot is able to withstand falls from a great height and opponent strikes and also from the outside there is a trunk for carrying things. WarStuffs Addon - set of military equipment for an experienced fighter. Helicopter addon - combat helicopter is at your disposal, sit at the helm and fly to destroy enemies. All the addons are compatible with the latest version of Minecraft PE (1.2.13 at the moment). How to install the Patriot addon?